也許真的有朋友從未見過這東西,已不記得這是那個年代的自家製作? 雖然我不吸煙, 但仍覺得這個小檔很精緻, 尤其當它放滿了五顏六色的煙仔盒時. 還記得當時比較盛行的有555, 萬寶路, 駱駝, 紅雙喜, 健牌, 還夾雜着一些可自行包裝的煙葉及煙紙...等. 當時的煙販檔沒有太多其它東西售賣, 似乎這小小的一盤生意巳經可養活一家. 煙仔盒上也沒有所謂的"吸煙危害健康"標貼, 是人民沒有這個意識呢? 還是根本煙民全都一早明白但他們需要的卻只是一刻鐘的自由自在, 於願足矣! 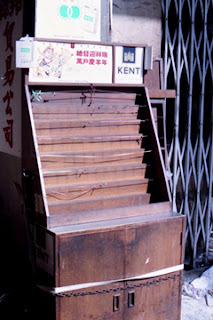 I am sure there must be some people who don't ever have a chance to see this stuff in their life in H.K., a DIY cigarette stall...I wonder which century it belongs to? Although I am a non-smoker, as far as I've remembered, this tiny stall always attracts me, especially when it was fully displayed with colorful cigarette packages. 555, Marlboro, Camel, Double Happiness, Kent, even with some small yellowish paper for customers to fill in their favorite tobacco leaves, then roll up to form a interesting "tobacco stick". Besides of the above + matches / lighter, there are not many variety of products you can find here, but it seems the hawker can still earn a living for their family through this small business. Also, you will not find any "Government Warning" of "SMOKING CAUSES XXXXX DISEASES" on the cigarette package, guess whether the smokers don't have any idea of health care or simply they are willing to exchange for a moment of mentally freedom? This stall should have already been crashed in the landfill, compare to what we can see on the street now a day, those "full-function" newspaper stall , not only cigarette, but soft drinks, snacks, umbrella..etc, etc. what a tiny 7/11 they are. Should we amazed by our improvement of living ? or regret to our "black-hole" that can never be fulfilled deep into our heart!